Weekly report №16 - New Year report. We postponed it until the very last minute because we wanted to release it with the first step of pre-alpha, alas. This report will be dedicated to pre-order content. But we won’t tell you about the pre-order except the descriptions of the characters that we’ve created for the bundles. Black knight - it’s a duellist-individualist. Something cold and dark. Banneret - it’s a social person, the head of a group or a little guild. Raubritter (robber knight) - it’s a leader of a collective that doesn’t hide his origin and even boasts of it. There will be 4 animations in every pack. But we will show only 2 from every pack to reduce the weight of the news page. Black knight. His social animations will be more appropriate for the duels. It addresses to the rival or the crowd of spectators. By the way, later we will show our animator Vlad as an actor for the mockup. It makes animations not only more realistic in this case but also quicken our work. It takes a long time to create such animation by hand. Now let’s go to the banneret. He’s a social person. Facepalm, of course. Without this animation it’s hard to imagine the relations with a collective, and especially with the friends, isn’t it? Raubritter. The head of a collective. He should be able to raise the soldiers from a trench. And to play his favourite balalaika at a dinner party (by the way, now we choose the main soundtrack and it will be with guitar). After pushing the hotbar button (by default - Y) the cells of main hotbar will change to the social hotbar. After it you can start the playing of the social animation, using the chosen for the main hotbar buttons. Yep, yep! That’s it! This is the real wing of feathers. 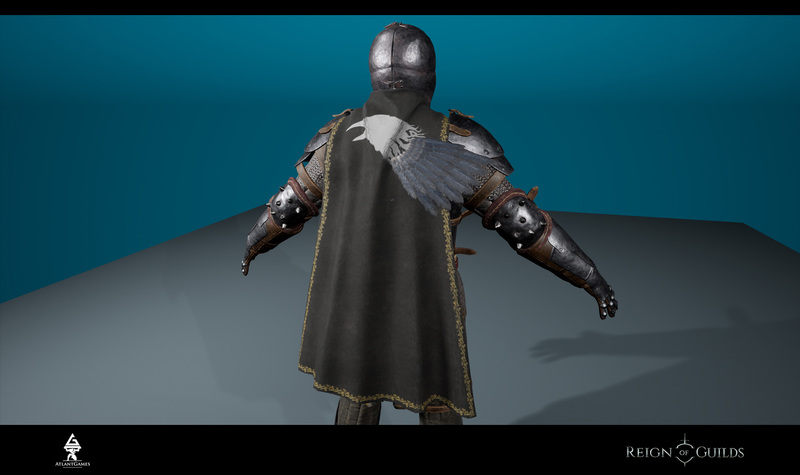 The wing of a black raven for the cloak of the black knight. For the black knight there’s no need to boast of his wealth. 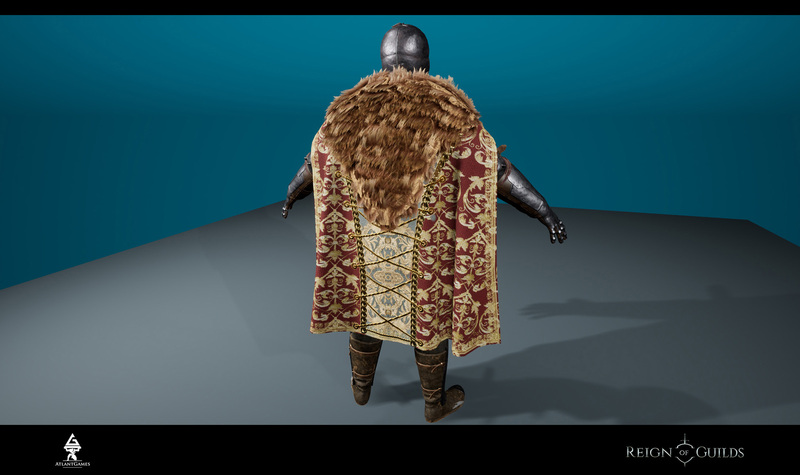 That’s why he chose the simplest fabric for his cloak. The moderate length doesn’t hide the battle pads and doesn’t restrict movements. 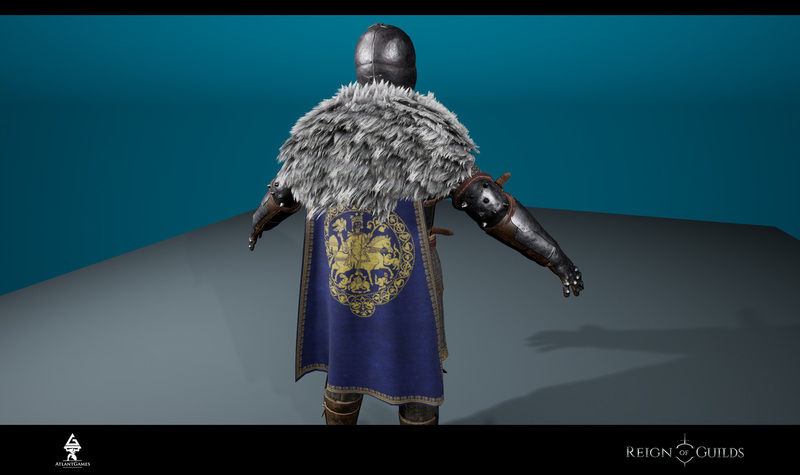 Banneret gets the velvet cloak and the cape of the wolf skin on the shoulders. But the pads will be hidden. And the raubritter, on the contrary, gets the most massive and expensive cloak and the cape of the fox, that would be enough for the half of fur coat for his wife. 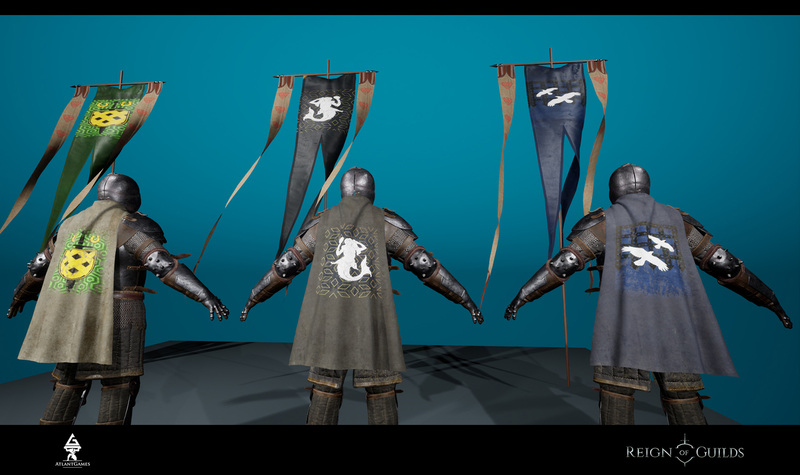 Coats of arms on the cloaks and flags are very important elements for the individualization of the guild. 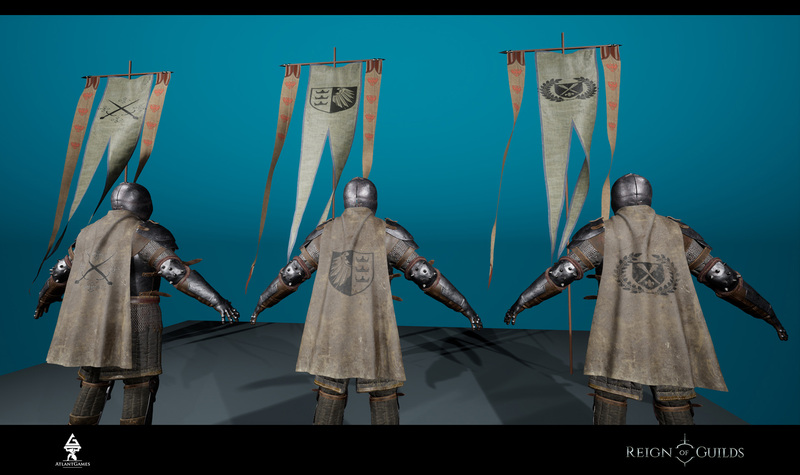 That’s how the basic coats of arms will look like. All guilds higher than level 3 can use it. That’s how the exclusive coats of arms of a banneret will look like. This is the exclusive coats of arms of a raubritter. And possibility of a senior to get the royal title. The guild level depends on the share capital. If the capital reduces because of the wrong financial decisions the guild will get the game month to make contributions. Otherwise, the guild level will be lowered with all its consequences. Reached level 10 the guild can add its own coat of arms (after approving it by the administration). 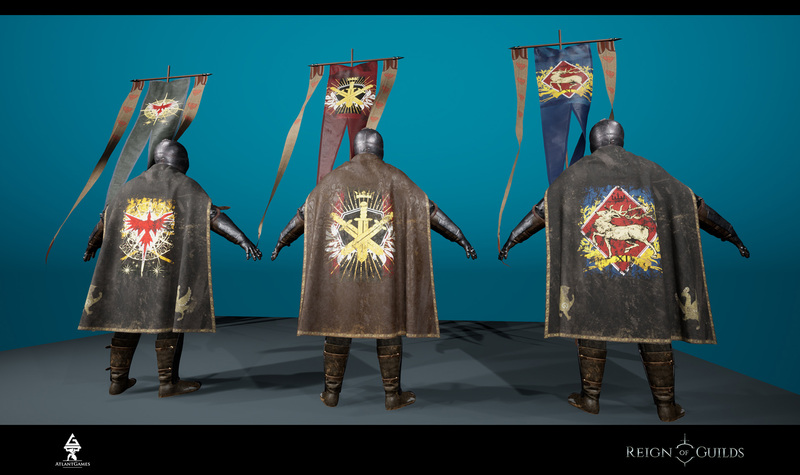 We didn’t add this opportunity in pre-order because we consider that such strong symbol of individualization as personal coat of arms should be got only in game. 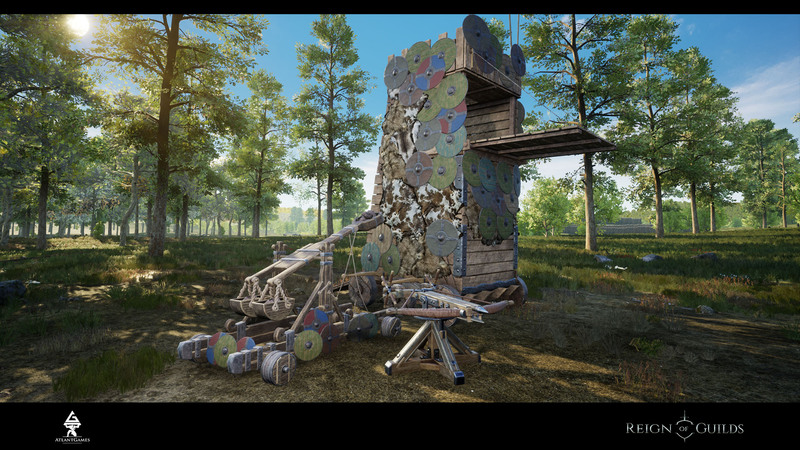 That’s how first level siege weapons will look like. And its skins. If you read our reports from the start, you have already seen the towers and ballistae, but not the catapults. The trebuchet is ready too but it isn’t included in pre-order because it’s the siege weapon of the second level. And its skins can be got only in game. 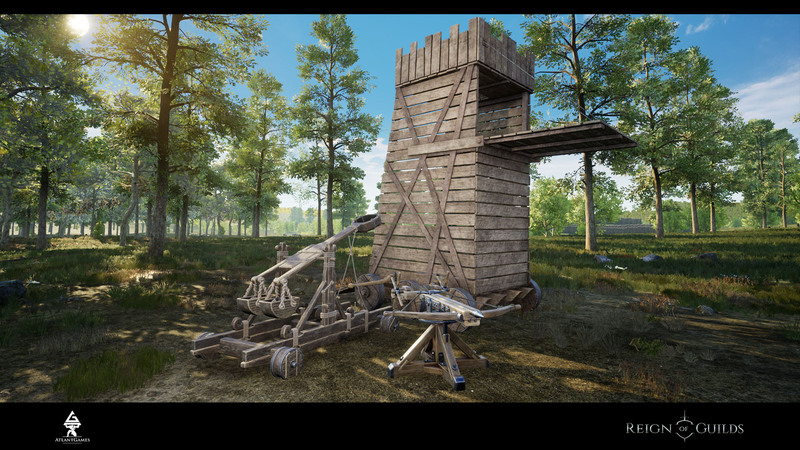 We’ve told about the siege weapons in the previous report. Another year is coming to an end. This year was fundamental and decisive year for ROG. The team gradually grew and now we are full studio. Although we plan at least 6 new team members. We can’t tell that this year haven’t brought bad news and events. Especially there were many of them in the last quarter. However, we still here and it means that we more or less solved our problems. The launch of new site we postponed to the 2019 (after holidays at once). Together with the new site we will launch pre-orders. The first step of pre-Alpha: we finished to add new items on Tuesday. After it during the construction of a test build we got 2 difficult bugs that can break the main mechanics. Solving this bugs our programmers stopped today, the 30th of December. We didn’t solve the problem. What hinder the building of the project without bugs - we will recognize it in new year. To speak in general about 2018 for ROG - we have done impressive work. There almost wasn’t any staff turnover. We build the production process. The speed of the development increases from month to month. In 2019 we still have a long way. We plan to finish the creation and addition of the content for the Early Access in the third quarter of 2019 (on the Beta-2 stage). All 4th quarter we will leave for the editing of bugs and optimization. That’s why the Early Access will duplicate the Beta-2 on the available content. The only thing that can make us postpone the date of the Early Access from 4th quarter of 2019 to 1st quarter of 2020 - it’s that the end of the year is the worst time to release the game on the platforms. We will consult on this issue with the publishers and the platforms. On behalf of the team I say thanks to all people who follow the creation of our project, take part in discussions, help with the testing and support us with likes. Your support is very important for us. And, taking the opportunity, I thank our team for the work done, for the efforts made and energy that they put to our project every day and sometimes on weekends. Happy New Year to all of you and see you next year! P.S. The report №17 will be published on 11.01.2019. At the festive table when the chimes is striking - ROGgoms up, friends!